Nguni cattle and Zulu men and women. These small figures were well-known in the Eshowe area for some 40 years prior to Ntuli’s death and were collected by local residents, tourists and notable personalities in South Africa’s colonial administration. His remarkable talents had been noticed when he was only seventeen by Dr John Holloway of the Native Economic Commission in Natal. Holloway was of the opinion that Ntuli should not receive any formal art training, for fear that it would destroy his ‘uncanny instinct for putting life into his models’.1 ‘Whatever may be the future of Hezekiel’, another source remarks, ‘there is no doubt that his work does bear the stamp of genius. His leopard in a tree, ready to spring, breathes vitality.’2 It is not possible to identify this small sculpture of a leopard in a tree in the Campbell Smith Collection (plate 29) as that which Holloway refers to, since many similar ones were made. The denial of formal art training to Ntuli for fear of ‘spoiling innate, natural talent’ echoes the situation of Gerard Bhengu (qv. ), and highlights the short-sightedness of colonial paternalists like Holloway. In 1931 as many as 71 of Ntuli’s sculptures were donated to the Natal Museum in Pietermaritzburg, making him one of the first black artists in KwaZulu-Natal to be identifiable by his own name in a public collection. Mention of this collection was overlooked in Steven Sack’s catalogue for The Neglected Tradition, published in 1988.3 Ntuli was reportedly ‘discovered’ by the donor of this collection, a certain Stanley Williams, who met Ntuli in Pietermaritzburg’s town centre in 1929 when the latter was trying to sell his small clay sculptures to passing white pedestrians. 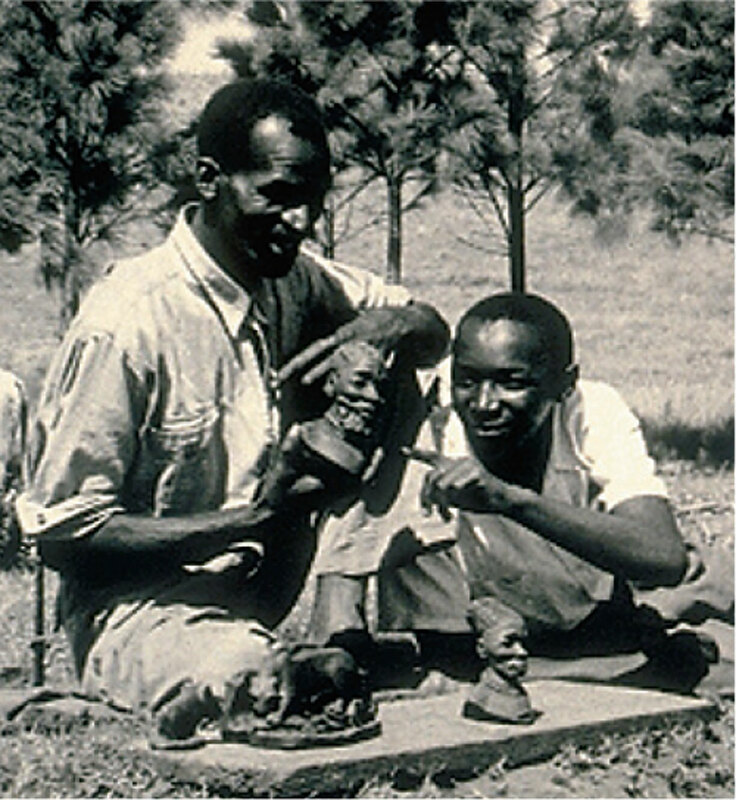 Despite his apparent concern for quality in Ntuli’s work, Williams also had a clear eye on profit for himself, for the same article reports his plan to get a Durban-based firm involved in the bronze-casting of 100 Ntuli sculptures for wider colonial consumption.5 In the longer term his relationship was apparently not of great financial benefit to Ntuli and it ended at some indeterminate point. What appealed to colonial admirers of Ntuli’s work was the compellingly life-like appearance of his animal pieces in particular, even if the handling of facial details was sometimes considered awkward.6 The artist’s reputation in white society was enhanced by his winning the first prize at the Royal Agricultural Show in Pietermaritzburg in June, 1930. This attracted the attention of such personalities as the Countess of Athlone, wife of the ex-Governor of the Union of South Africa, who purchased his work. He was also presented to King George VI on the royal visit to South Africa in 1947, and again to the royal party when he was a resident artist at the Rhodes Centenary Festival of 1953 in Bulawayo, Southern Rhodesia (now Zimbabwe). The Natal Mercury, 13 October, 1930. Unidentified newspaper article dated 12 September 1931, cited by Elza Miles in Land and Lives, 1997, pp. 37–38. Ian Calder. 1997. ‘Zulu Warriors, Nguni Cattle and Wildlife: The ceramics of Hezekiel Ntuli in the Natal Museum’, Proceedings of the 12th Annual Conference of the South African Association of Art Historians, University of Natal, Pietermaritzburg, p. 3. Apparently the bronze castings were made, but only two surviving casts of a Zulu induna survive. See Miles, Land and Lives, pp. 36, 40. Born Eshowe District, Natal, 1912; died,/b> Mlalazi, near Eshowe, 1973. Training Educated at a mission school near Entumeni, followed by two years schooling in Pietermaritzburg. Exhibitions 1930: First works exhibited at the Natal Museum, Pietermaritzburg. 1931: ‘Native section’, SA Academy Exhibition, Selbourne Hall, Johannesburg. 1932: ‘Native section’, SA Academy Exhibition, Selbourne Hall, Johannesburg. 1936: Empire Exhibition, Johannesburg. 1966: Museum für Volkerkunde, Kiel University, Germany. Collections Killie Campbell Collections, University of Natal, Durban; National Cultural History Museum, Pretoria; Zululand Historical Museum, Eshowe; Natal Museum, Pietermaritzburg. Awards 1930: First Prize, Royal Agricultural Show, Natal. Hezekiel Ntuli. Source: Collection of Peter Endlom.